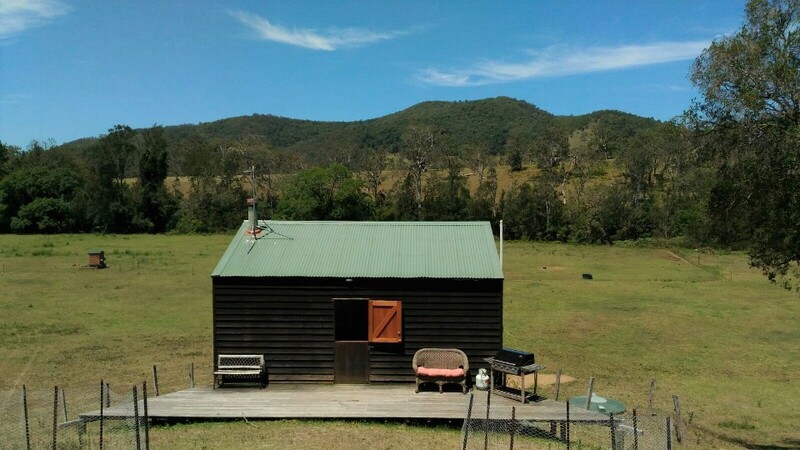 In late December 2016, our family had the opportunity of spending two nights at Ged and Sophie's organic farm stay at Ellenborough - they are also known as the Naked Farmers! From memory, the farm is located about 40 minutes to 1 hour from Wauchope if driving in a non-4WD; Wauchope is, in turn, about 20 to 30 minutes away from Port Macquarie. The farm covers 400 acres of land from memory. Here are some pictures of our time there. There is a shower and toilet, a microwave, a sink, a fireplace, a table, outdoor BBQ set and a kettle. The solar-powered cabin can probably house up to 5 people+ depending on whether you are comfortable bringing along sleeping bags and/or sleeping on the couch. But it's best to check with Sophie and Ged as I don't know if they have limits on numbers. 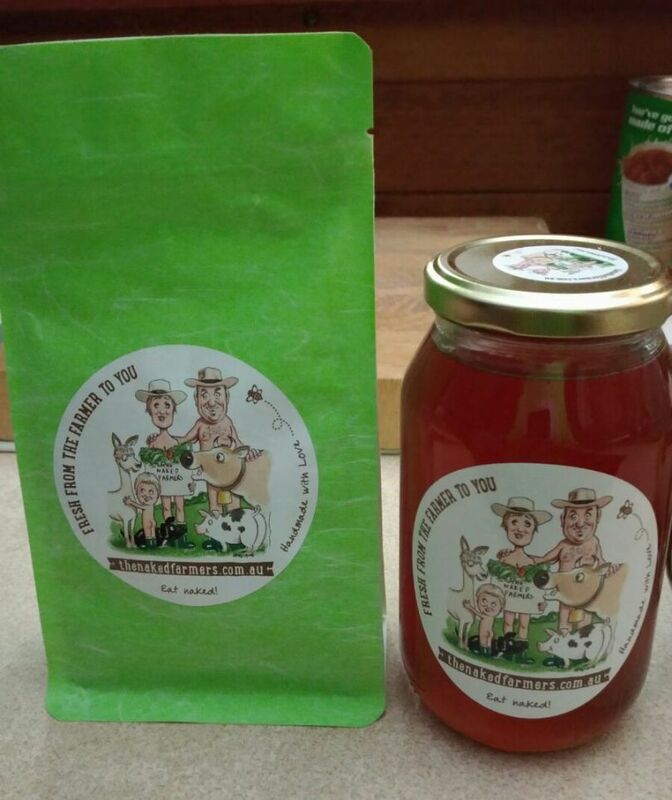 Yoghurt, muesli, honey and lemon verbena tea were all provided in our cabins when we arrived. We liked the tea and honey so much that we bought some. It is amazing seeing the farm animals 'doing their own thing': roaming freely on the land and migrating unsupervised in their herds. 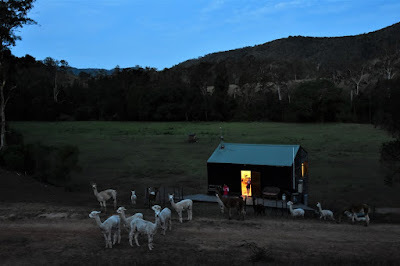 Sometimes the alpacas and cows migrate from the plains below up onto the slope near the cabin in the evening and at night! In particular, Angel and Firefly are very friendly and love being close to humans. There are also pigs, horses (including wild ones), geese, ducks and ducklings, chicken and sheep at the farm. Wallabies can be found hopping around randomly too. You might spot an eagle every now and then as well. When the weather is hot, it's nice to go down to the nearby creek for a swim in the shade or to enjoy the shelter of the rainforest which is often about 10 to 15 degrees celsius cooler than the outside temperature. The highlights of our stay were interacting with the animals, looking at the starry sky in the middle of the night and I suppose just learning to enjoy the simpler things in life. One aspect of our stay that we were not used to was the number of insects that came out at night (they were all attracted to our cabin lights! ); however I suppose that must be normal living out in the country. It was a good experience to have nonetheless. Summer can be quite hot but the cabin's windows are designed to catch the cool breeze which is quite effective in the absence of air-conditioning. If we re-visited we would probably stay during Spring or Autumn. Ged and Sophie are really lovely people and are happy to talk to you and show you around if they are not busy tending to the farm or feeding the animals. 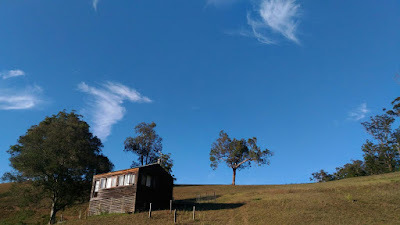 In particular, Ged drove us around in his 4WD to show us the width and breadth of the farm, and he also gave us a very thorough update as to what was going on and the future projects that were planned. Ged answered all our questions, no matter how silly they were and he was a friendly tour guide. I understand that you can also choose to camp at the farm rather than stay at lodgings. I am sure there are other options and activities that are available too. I would recommend this place to any of my friends who are interested in escaping the hustle and bustle of city life for one or two nights. It is a real eye-opener taking time out to relax in the country. You can probably combine this trip with a stay at Port Macquarie. All photos, except the photo of Angel, are courtesy of my mum!